After I had waited for a time….I was put into a small, white, carbolicky bed, and it took a while for my arm to heal. Here were the stout sister that you see bringing the tray to Madeline, and the crank on the bed. In the room across the hall was a little girl who had had an appendix operation, and, standing up in bed, with great pride she showed her scar to me. Over my bed was the crack in the ceiling “That had the habit, of sometimes looking like a rabbit.” It all began to arrange itself. And after I got back to Paris I started to paint the scenery for the book. I looked up telephone numbers to rhyme with appendix. One day I had a meeting with Léon Blum, and if you take a look at the book, you will see that the doctor who runs to Madeline’s bed is the great patriot and humanitarian Léon Blum. Grand. If only it were that easy. 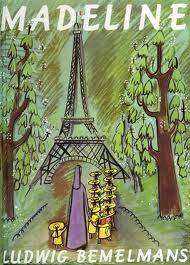 No doubt, the biking accident played a role in the evolution of Madeline, which took shape after Bemelmans returned to New York and sketched the basic story in a bar called Pete’s Tavern in lower Manhattan. Initially, the story wasn’t an easy sell. May Massee, his usually perceptive publisher at Viking Press, turned it down. The drawings were felt to be too sophisticated, the rhyming text too clumsy. Like a lot of things in Bemelmans’life, Madeline’s origins went back much further, into his spectacularly troubled childhood. For anyone with a taste for psycho-analysing authors via the fiction they write, Ludwig Bemelmans is a veritable gold mine. Above all, I admired [Papa’s] skill with napkins. After deft and precise folding of the snow-white linen, he turned the napkins with a last twist into the shapes of fans, ships, plants and swans. He also chiselled swans and castles out of blocks of ice. Then came calamity. Papa got Emmy, the woman who later became his second wife, pregnant, and ran off with her. Gazelle, also pregnant with Papa’s child, committed suicide. All had come to an end. Papa was gone, and so was my governess, and I wished so much that he had run away with Mama, and left me Gazelle… In the beginning, Mama tried to replace Gazelle; mostly in tears, she dressed and undressed me. There were no children’s books and she would tell me stories about her own childhood – of how alone she had been and how she was shipped off to a convent school…how the little girls slept in little beds that stood in two rows and how they went walking in two straight lines, all dressed alike. She was much happier than at home, for her parents had never had any time for her. This made me very sad. She cried, and I cried. She lifted me up. I looked at her closely, and a dreadful fear came over me. I saw how beautiful she was, and I thought how terrible it would be if ever she got old and ugly. By his mid -teens, Bemelmans was an untameable wild child. After an uncle gave him a job as a busboy in one of his hotels, a headwaiter went at Bemelmans with a whip and the teenager shot him. 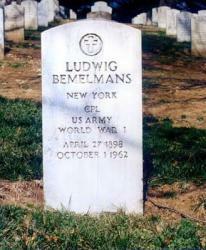 Faced with a choice between going to reform school or being shipped off to America, Bemelmans chose America, spent a stint in the US Army, and worked briefly in a state mental asylum. Life never really settled down for him. A largely self taught artist, he combined a career of service in the hotel industry with sketches of the guests and managed to thrive in the crazy, madcap years of the Roaring Twenties. Within ten years, he had worked his way up from busboy to being co-manager of a bar/hotel – and then with exquisite bad timing, he threw it all away just two weeks before the crash of 1929. A decade of scrabbling for survival followed, punctuated by guilt for the accidental death of his brother, whom he had lured to New York. By the late 1930s Bemelmans’ talent for networking and his abilities as a writer/artist had landed him work in the New Yorker magazine. Encouraged by May Massee at Viking Press, he also began writing children’s books, and his third book Madeline not only made his career – it unleashed a floodgate of some 20 books of travel stories, memoirs and reminiscences. These included Hotel Splendide (1941) a thinly disguised account of his scandalous working years at the Ritz Carlton in New York. By 1945, he was in Hollywood, where he wrote the script for a Vincente Minnelli/Fred Astaire fantasy film called Yolanda and the Thief, which bombed at the box office. Enough, already. Yes, the creator of Madeline does appear to have hated women. 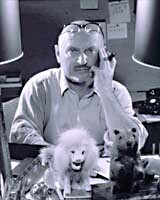 Lively, always restless, and a raconteur who lived on the borderline between truth and fantasy for most of his life, Bemelmans died relatively young of pancreatic cancer, at the age of 63. Madeline and her several lesser sequels live happily on however, amid a vast array of Madeline-themed merchandise, ranging from dolls to furniture to toothbrushes. Most attempts at explaining the book’s enduring appeal end up as mere description. The peculiar charm of Madeline escapes untouched. Certainly, the structure does juxtapose the feisty spirit of Madeline – who could be anywhere between 4 and 8 years old – with the conformity of an environment comically represented by the straight lines of beds, dining tables and walking groups. 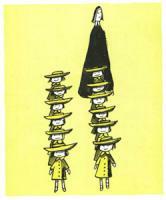 Not to mention the angular presence of Miss Clavel. Yet everything else about the book…the drawings, the central drama, the loopily stretched rhymes is elongated and unreal, and exuberantly self-mocking. The rhyme where the doctor calls the hospital “ And he dialled DANton-ten six – Nurse,” he said, “Its an appendix!” is merely the worst of several intentional groaners. To my mind, the self parody is what keeps the book so airily buoyant even when depicting events that could otherwise be quite harrowing. For a child, living in an institution far from one’s parents, and then getting sick and being rushed to hospital could be the stuff of nightmares. 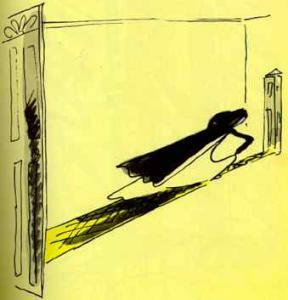 Indeed, Bemelmans drawings are dream-like in nature (James Thurber and Raoul Dufy are the usual comparisons) and make no attempt at anatomical or architectural realism.